Mercury rules Gemini, so its retrograde in Sagittarius, which acts as Gemini’s shadow. should also prove interesting! The cycle begins with the Pre-Shadow at 1:49 am UTC on November 15. 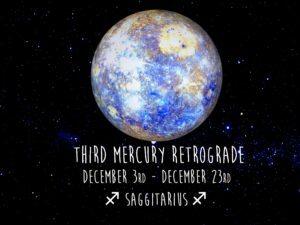 Mercury Retrograde station occurs at 7:34 am UTC on December 3 in Sagittarius (29o18″). For those living on the West coast time zone in the US, it will occur at 11:34 pm on December 2. Mercury goes direct at 1:51 am UTC* on December 23 in Sagittarius (13o00″). Note that in North America, this would be during the evening of the previous day, December 22. The Post-Shadow ends on January 10, 2018 at 4:31 pm UTC.